I live in NYC and have some chicks & hens growing on my windowsill. Lately I've noticed some of the leaves turning brown and today I spotted some teeny tiny green bugs on some of the leaves and little white dots within the inside of the plants. I thought they might be aphids but they don't look like pics that I've seen online. Can you help me identify these pests so I can get rid of them? Comments for BUGS! what are they? Aphids go through several 'instars' or molts, and that's what the white parts are - cast off skins that they shed as they grow. Aphids are particularly bad if they are farmed by ants or wasps. For some reason, these seem to carry viruses that can cause many issues such as mosaic virus. Keeping these hardy succulents indoors is part of the problem - they bring the pests in with them so it's important to completely isolate them from other plants and make sure you've killed off all the hitchhikers. You can get rid of aphids with a lot of work. It's important to have background information to help combat them - one of the most important bits of knowledge is that their lifecycle is about 23 hours - which means that if you spray once a day for a week, you'll end up missing at least one generation, so your work will be for naught. They are also capable of producing live young, all females, without the benefit of a male. Interesting, huh? 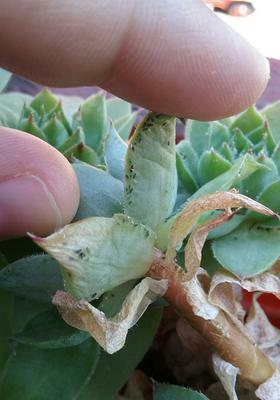 Use insecticidal soap and make sure you saturate all the crevices of the plant. The aphids worm their way deep down and are almost impossible to eradicate unless you are consistent in spraying and don't get complacent. There are other recipes if straight soap doesn't work. I've collected many of them in the Plant Pests E-Book.